Do you remember that Skoda advert from about ten years ago, the one where they built a life-size Fabia out of cake? At a time before shows about baking cakes were enough to cause nationwide scandal that is. This is kind of like that, but with cardboard. At one time or another, most of us have made a cardboard car. When you were a kid, there was no better way to spend an evening than to sit in an old TV box in your living room, making car noises and annoying your parents. Well, before iPads anyway. Skoda has taken that nostaligia, added a touch of marketing knowhow, and given the world another great advert - the 'Kid Karoq'. And, while it definitely wouldn't be much use in the rain, it definitely brings the fun factor back to car commercials. 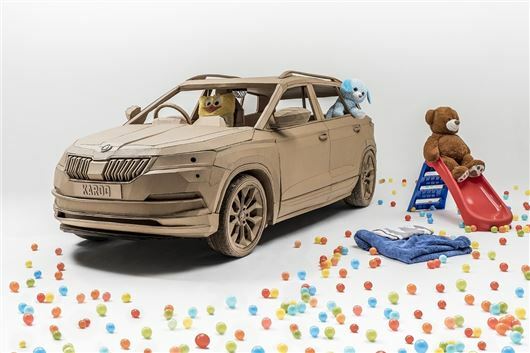 Commissioned by Skoda to celebrate the launch of the new crossover, the manufacturer drew inspiration for the cardboard version from 1000 kids aged 6 to 11 - who told Skoda what features they’d pack into their perfect car. "Please let's not listen to Frozen again...."
The life-size cardboard creation took 10 weeks and more than 600 hours to construct. It has been built to the exact scale of the real Skoda Karoq: 4.4 metres long and 1.6 metres tall. Despite the tech-heavy replies, the research highlighted that childrens' imaginations are as active as ever - with almost three-quarters of kids surveyed having built their own cardboard creations. The cardboard centre console houses a digital tablet that controls a set of wireless speakers and mirrors many of the features found in the real Karoq’s infotainment system. A slide and ball pool take pride of place in the Kid Karoq, containing over 1500 balls – the precise number of balls that fit into the real Karoq's 1810-litre boot. Other features include WiFi hotspot, a film projector, play-time bean bags and a toy box.